You'll be £10.00 closer to your next £10.00 credit when you purchase Flying, Fighting and Reflection. What's this? This is the thrilling account of the Battle of Britain ace fighter pilot, Tom “Ginger” Neil. Neil was one of an elite band, nicknamed “The Few” by Winston Churchill, he flew Hurricanes during 141 combat missions in that battle and went on to command the first Spitfire XII squadron during 1942/43 as the RAF went on the offensive in north-west Europe. In this, the only full account of Neil's life to be published in collaboration with his family, we learn how he became a poster boy for the war effort and how he credits his “sixth sense” for keeping him alive during the Second World War. There was, however, one terrifyingly close brush with death, when in 1940 he had a mid-air collision with another Hurricane. With the rear section of his aircraft gone, the plane was out of control and hurtling to the ground, yet somehow he managed to bail out and miraculously survived with only a minor leg injury. As well as RAF service during the Siege of Malta, Wing Commander Neil, who passed away in July 2018, mere days before his 98th birthday, also served with the Americans during the D-Day landings. During his career, Neil was awarded two Distinguished Flying Crosses for the destruction of at least fourteen enemy aircraft, and was a successful test pilot after the war before commanding a jet fighter-reconnaissance squadron in Egypt's troubled Canal Zone during the 1950s for which he was awarded the Air Force Cross. With contributions from the man himself, this book also looks at his life after the RAF and his career as a successful author. For military buffs and novices alike, it is a must-read account of a true war hero. The extraordinary story of the life and times of Wg Cdr Tom ‘Ginger’ Neil, the last surviving Battle of Britain ace. Tom Neil served with 249 Squadron, RAF at North Weald, when Victor Beamish was Station Commander from September 1940 to May 1941 and died earlier this year at the age of 97 as one of the last surviving Battle of Britain pilots. This book will be of particular value to those interested in the history of North Weald Airfield. 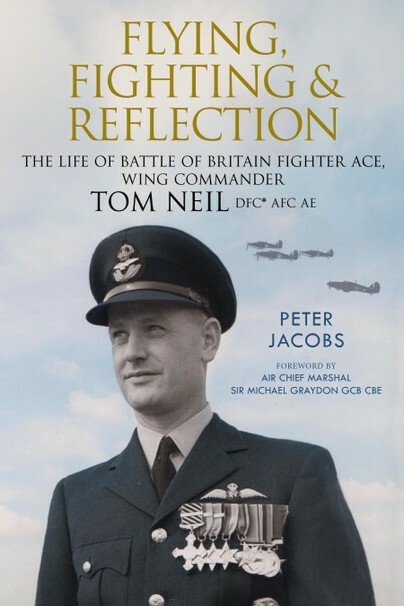 Biographer Peter Jacobs and author of many books on aviation topics with the help and co-operation of Tom Neil and his family have documented his life.